As I read and study and practice all things beer, I've come to have a more keen awareness of bottle shops. Not only the one where I work but those that I've added to my network of stops along the way. I hear it every year, "What, Oktoberfest beers in August? It's too soon!" My first encounter with a New England IPA was a gift from a friend. It was like a drug deal from the back of a mini van. THE SESSION #125— BEER BLOGGING FRIDAY The Session, a.k.a. Beer Blogging Friday, is an opportunity once a month for beer bloggers from around the world to get together and write from their own unique perspective on a single topic. Each month, a different beer blogger hosts the Session, chooses a topic and creates a round-up listing all of the participants, along with a short pithy critique of each entry. This month's theme is SMaSH Beers and is hosted by Mark Linders at Bend Beer Librarian. The question posted by Mark is SMaSH beers (single malt, single hop). 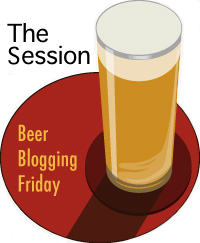 I enjoy the topics that people come up with for these BEER BLOGGING FRIDAY themes. Sometimes the strike a familiar cord and I can't wait to jump in and begin sharing my thoughts on whatever the topic chosen. Then other times, I have to admit, I simply let the theme go, like a gentle breeze that was here and it's gone. Then there are even some times I'll begin writing with some clever — I think it's clever — take on the chosen topic, never to finish it. I hate that, but it happens all to often. But SMASH beer? I thought I'd heard of everything under the beery sun but that... is it a term, a style, a joke? Mark obviously is a home brewer and SMASH beers seem to be a style that is popular among that group. So I had to do a bit of research beyond what Mark had provided in is introduction. Rate Beer knows that SMASH is a real thing! They list 50 beers under the label of SMASH beers. I can say I haven't had any of these beers noted as SMaSH beers. Nor do I think I could find any at my local beery shops. That isn't to say that I haven't had a single malt, single hop beer, it's just that it wasn't identified as such. Honestly, I've seen brewers promote the fact that they were multi-malt and multi-hop more often. Southern Tier is an excellent example. Draft Magazine declares the perfect SMASH six-pack in their Sixer: SMaSH beers piece. Of these six, three were ID of SMASH and three did not. So perhaps I have had a SMASH beer and didn't know it. Reviewing my list of unique beers tasted on my Untappd account, I didn't find anything referencing a SMASH beer. Entering "smash" into the Search and scrolling through that list, I didn't I'd any that I've had nor would have easy access to. THE SESSION #122— BEER BLOGGING FRIDAY The Session, a.k.a. Beer Blogging Friday, is an opportunity once a month for beer bloggers from around the world to get together and write from their own unique perspective on a single topic. Each month, a different beer blogger hosts the Session, chooses a topic and creates a round-up listing all of the participants, along with a short pithy critique of each entry. For American and Canadians: What place do imported beers (traditional European) have in a craft beer market? For Non North Americans: How are American beers (imported into YOUR country) viewed? What is their place in your market? It seems like so long ago now, probably because it was, when I first began exploring the world of beer. It wasn't anything like a study, but a casual curiosity. A good beer was Michelob, a special beer was Becks. I felt the need to stand out from my peers, so mine was the dark one. Imports were premium beers — for those who wanted to treat themselves to the finer things. I still remember my beer epiphany, the moment I had a really good beer. I've written about this before, but I do like to think about it again. A bar in Baltimore, a bit of time before a weekend conference, a bartender perhaps wanting to upsell me. Nonetheless, I was interested in learning more. So he suggested this English beer, Samuel Smith's Nut Brown Ale. Smitten, I was. After that, nothing was the same. It was difficult to find this beer, but I did. It was more expensive than my normal beer. So it was on special occasions I would bring home a 500 ml. bottle. That must have been around 1991. I began working in a local fine wine, beer and spirits shop that was opening just a few minutes from my house just over nine years ago. It was a move to help pay some schooling bills and thought to be a temporary job. I gave it two or three years. Right! That was nine years ago. Why am I still there? Well two things really, I enjoy the people and two, I enjoy learning about the stuff. All of it, wine, spirits and especially the beer. And the good beer (some call it craft) business certainly has changed over this time. The more I learn about beer, the more I realize I don't know. There are many people who are willing to teach. And, I'll have to say, I've done a lot of study on my own. Grin! So, good beer began with me as imported. Then the American scene has grown up, again. And we don't have to look across the pond to find good beer, there is plenty to be found on our own shores. And for that matter, right in our own backyard. It continues to surprise me the number of small town breweries are popping up. And they are producing some really good beer. Do we still need to seek our "good beer" fix from imports? Of course not. But I still often do. That is, because the American beer scene has started a new beer revolution, that has caused me to learn more about the beer I'm drinking. And if you haven't noticed, many of those great American beers have Old World names, referring to the classic European styles from our brewing legacies. Oatmeal stout, kolsch, altbier, gose, guese. Check out the Beer Judge Certification Programs list of beer styles. How many were founded in Europe and are now taking on an American swagger. Last year we celebrated the 500 year anniversary of the Reinheitsgebot, aka the German Purity Law of 1516. Some of the interviews of contemporary German brewers described were how hand-tied they felt from the restrictions of that law and the need to brew to those simple list of ingredients to remain in the German brewery associations. They wanted to break out and explore the world of ingredients like many of the new American brewers. Sam Calagione of Dogfish Head stated in an April 2016 The Daily Meal article that, "The reinheitsgebot is nothing more than modern art censorship." Now that the good beer movement has introduced and attracted partakers to what well made beer is like, many are willing to venture beyond the IPA and discover the classic styles, whether from to old-country or domestic versions. Pilsner is making a comeback in America. Of course it is, it is a great beer. So yes, imported beer does matter. It is a great teacher of history, technique, ingredients and geography. For example, as much as you hear about terroir is important to wine, the same holds true with beer. Try an American made pilsner, then have one from Germany or a Pilsner Urquell from the Czech Republic. Same style, far different beer experience. I recently taught a beer tasting class where the focus was on four iconic beers, three of which were imports. The purpose being that many of the beers we enjoy today have a lineage back to Europe. In order to fully appreciate the beer being produced and offered in pubs and bottle shop today, it is best to understand from where they came. The era of industrial American light lager not only reduced the choices of what beer drinkers were offered, it turned many off to beer, period. With the establishment — or re-establishment — of an American good-beer industry and culture, beer drinkers are exploring and expanding their tastes. And while Americans are being introduced to classic styles after our IPA binge, brewers are leading the way with their versions of the classics, take the list of gose that has been introduced and become so popular during the last few years. The concern that foreign brewers are keenly aware, are the Americans are doing such a good job of it! Due to their Bavarian accent, citizens of Munich pronounced "Einbeck" as "ein Bock" ("a billy goat"), and thus the beer became known as "bock". To this day, as a visual pun, a goat often appears on bock labels. In early December 2017, I to traveled to Lansing Michigan. I was only there for a couple days, so any in-depth beer research was limited. But I did come home with some local beer bounty. THE SESSION #120— BEER BLOGGING FRIDAY The Session, a.k.a. Beer Blogging Friday, is an opportunity once a month for beer bloggers from around the world to get together and write from their own unique perspective on a single topic. Each month, a different beer blogger hosts the Session, chooses a topic and creates a round-up listing all of the participants, along with a short pithy critique of each entry. The colour brown has certain connotations, some of which I won’t dwell on. But used in reference to beer, it can signify a kind of depressing old fashioned-ness - to refer to a traditional bitter as ‘brown’ seems to suggest it belongs to a bygone corduroy-trousered era. As breweries who pride themselves on their modernity focus on beers that are either decidedly pale or unmistakably black, the unglamorous brown middle ground is consistently neglected. Brown my any other name is still the same color — marrone, marron, bruin, brun, bruin, braun or brown—or is it. And beer styles may be similar but still very, very different. Some brown or brownish beer styles include: Oud Bruin, British Brown Ale, American Brown Ale, Brown IPA, London Brown Ale, dunkel, dubbel. So its a wide field. Brown is not black but a brown ale can be black. Take the Dogfish Head Palo Santo Marron for example. I had the pleasure of touring the Dogfish Head brewery in Milton DE a few years ago. Part of the tour took us by the Palo Santo Marron wooden tanks. These were impressive to stand near. It has been reported that the barrels costs $140,000 and were questionable whether those costs would ever be recouped. The founder, Sam Caligione (Youtube: his take on Palo Santo Marron), said in a New Yorker magazine article (see reference below) that if worked for a publicly owned corporation that he would have been fired for this move. I assume they have paid for themselves, but it does make for a good story. For the greater story, jump over to an excellent 2004 article by the New Yorker entitled A Bitter Brew which describes the story of the journey to Paraguay, the discovery of the wood behind the beer as well and the man behind the wood (and beer). My first experience with this beer was not a pleasant one. The tasting notes on the side of the bottle suggest caramel and vanilla. Remembering my first sip all I could think of was a huge black licorice bomb, which at the time I thought was too big and not pleasant at all. I had purchased a four-pack, so I had three more to level out my opinion. The second seemed more mellow, but still a big beer. By the time I'd finished the fourth, I was a convert. Now it is one of my favorite beers and high on my DFH list of brews. To drink one, it is an opaque black beer (darker brown) and pours a big tan colored head that quickly fades. As read on the label, you get notes of caramel, vanilla, bittersweet chocolate. At 12% ABV you are going to get some boozy character, but it is a very well balanced beer. There are hints of the wood but not overpowering like you might expect. BeerAdvocate labels is as an American Brown Ale and rates it at 93 points. Palo Santo wood is highly prized for its properties, even before it became famous for its beer improvement characteristics. In an article 11 Things You Never Knew About Palo Santo, it describes when Spanish monks first discovered the wood and experienced its ability to seemingly cleanse and heal, they named the tree “palo santo,” which means “holy wood” or “the wood of the saints.” The tree grows in the South American rainforest and its scientific name is bursera graveolens, or “a bag of oil” and the naturally aromatic wood from this truly unique tree is used in several ways for energetic and healing purposes. Its primary use is to burn small palo santo sticks as incense (which you can find find online at such places as Amazon.com). On the hardness scale, it is measured as three times harder than oak and one of the hardest in the world. I find this beer fascinating not only as a wonderful drink to enjoy, but also for the effort exerted to bring it into being. The fusion of the wood and beer, ancient culture and domestication makes me pause as I sip it in — and not only because its 12% ABV. Not all browns are created equal — this certainly is a deep shade of brown. THE SESSION #118— BEER BLOGGING FRIDAY The Session, a.k.a. Beer Blogging Friday, is an opportunity once a month for beer bloggers from around the world to get together and write from their own unique perspective on a single topic. Each month, a different beer blogger hosts the Session, chooses a topic and creates a round-up listing all of the participants, along with a short pithy critique of each entry. My favorite beers to drink are large flavorful beers such as Imperial Stouts or Belgian Quads. I thoroughly enjoy the higher alcohol content, not that I'm working to become elevated as quick as possible, but just the opposite, so I can pour it into a beautiful goblet, let it warm a bit, sip and savor must like a fine port wine. I simply love the process, the fuller flavors and the entire experience. That is the best of all beer experiences — for me. American IPAs have become all the rage and many of my fellow beer drinkers love the hops — more the better. And I too, enjoy a well made IPA, whether of the West Coast variety or New England unfiltered offerings. They do have their place and I will savor the good work the brewer and company puts into these creations. The beer style that has jumped to public awareness lately — over the past year or so — are the sours. Of course, there are many beer styles that can be lumped into that grouping — wild ale, gose, Berliner weisse, flanders red, oud bruin, lambics, gueuze, and can include saison, bier de guarde depending on the brewers creativity. Some are included among my favorite beer styles. The beer that would be described as musty, funky, horse blanket, barnyard — I've had a difficult time cuddling up to. I've been to several beer distributor open houses where just about every beer style imaginable is available for tasting. So, I've experienced just about all that is out there. As already mentioned, I'm still quite particular to many of the Belgian beers: dubbels, tripels and quads. As I've progressed in my beer experiences I've learned that Belgian beer covers a wide range of flavors. Some I've had to pull away from, "How can anyone find that enjoyable?" Let the drinker beware! My take on the sours are much aligned with Ray Daniels, founder of the Cicerone Program. He stated in an interview that he appreciates everything about sour beers: how they are made, the ingredients, the process, history, etc. But he simply prefers other beer styles. My theory is this, that the more I expose myself to this style of beer, the more I will appreciate them. It's a theory! Really, I didn't even like the taste of beer on my first attempt. But then that was decades ago and the only beer readily available was industrial light lagers. I have come to enjoy the lighter side funk. For now, I have a great affinity for bold stouts and Belgian tripels and quads — I'm still learning to love sour. While this beer doesn't have Christmas or Winter in its name, this is a classic winter wheat beer. This is such a great Christmas-season beer because this style traditionally was a seasonal beer, brewed in the cool season, up until Spring, then put away until the cool season later in the year. Plus, it perfectly fits the Christmas beer profile, full of flavor, ruby color and higher ABV. The Schneider Weisse website is in Germany (there is the option for translations to English). ...full-bodied, dark ruby-colored... warming, balanced and soft. The oldest weizdock in Bavaria - since 1907! Its powerful body in combination with its malty sweetness offers real depth - a brilliant combination, perfectly tasty. Fits well to hearty, dark roasts and sweet desserts. Schneider Weisse Tap 6 Unser Aventinus scores a 96 points (world class) on Beer Advocate. The German's are proud of their language and its proper usage, so they off the correct pronunciation as ”veye-tssen-bock"
German Beer Institute states, "Comparable to the barley-based regular Bockbier (see there) a Weizenbock is the strong version of an unfiltered Weissbier or Hefeweizen. It is usually made with 60 to 70% wheat malt (German law requires that a Weizenbier, regardless of strength, be made from at least 50% wheat). The other 30 to 40% tend to be so-called Pils, Vienna or Munich malts. These are pale to amber, and sometimes slightly caramelized barley malts that give the beer a full-bodied mouthfeel, a rich and satisfying malty finish, and—depending on the barley malt's color—a more or less opaque appearance. While regular Bockbiers are lagers, Weizenbocks are all ales. They are fermented with a special yeast that gives the brew a slightly spicy, clove-like flavor." Beer Advocate offers a great description for this beer style. A more powerful Dunkel Weizen (of "bock strength"), with a pronounced estery alcohol character, perhaps some spiciness from this, and bolder and more complex malt characters of dark fruits. Few beers combine so exquisitely several different stylistic profiles as does weizenbock. Bavarian hefeweizen and dunkelweizen are known primarily for their natural haze, yeasty texture and extraordinary palette of top-fermentation products. Weizenbock expresses all the banana, clove and vanilla aromas and flavors of its less formidable brethren. These are tempered by a firm background of malt. TAP6 Unser Aventinus is brewed in Kelheim, Bavaria, part of the Schneider Weisse portfolio. Its has the claim as Germany’s original “wheat doppelbock.” The foggy mahogany hue is topped with a creamy beige head. The aroma bustles with banana, raisin, chocolate, cherry and licorice. This is followed by earthy flavors and dessert-like spiced banana bread, molasses and malt. All the senses will be filled with this Christmas beer. Spices, high ABV, gorgeous mahogany color. Schlafly is Missouri's oldest and largest craft brewery, right in the heart of St Louis and beyond. The Schlafly Tap Room first opened its doors in 1991 and proudly holds the distinction of being the first new brewpub in Missouri since Prohibition. CHRISTMAS ALE is a warming winter ale that blends the spices of the season with sweet caramel malt. Orange peel, juniper berries, ginger root, cardamom and cloves are added for spiciness. We use honey in the fermentation process, which raises the ABV without producing too much heat from the alcohol content. Many breweries produce richer, higher alcohol beers for the winter holiday season, bolder than their year-round offerings. The inspiration for this beer came from spiced holiday beverages such as wassail and mulled wines. Around the holidays, the sweet and spicy aromas, not to mention the booze, in such libations tend to smooth the rougher edges of enjoying each other’s company and spreading goodwill. This is one of the classic Christmas-season beers that should be on every beer lovers short list. Each year has been a different day from the song —The Twelve Days of Christmas — with a beer-take on that particular verse. As stated in The Bruery’s own description, this ninth edition is based on the Italian dessert ladyfingers. THE BRUERY 9 LADIES DANCING — This beery homage to the classic Christmas song, 12 Days of Christmas began in 2008. Then, A Partridge in a Pear Tree was just the first in the 12 Days/Years of Christmas Series. That beer has since been retired as have many others in this series. So, if you want to try this beer, first hurry, because supplies are dwendling, and also, it won't be reproduced next year... And perhaps not for another 12 years. Food Pairing: Sartori Espresso BellaVitano cheese, roast turkey with bacon-cranberry chutney, spiced parsnip and sweet potato mash. The cotillion plus one. A bite of tiramisu. The first reference to this pair of yin yang beers was from 2015 Christmas season. The names make reference to your Christmas list and whether what gifts Santa will be bringing youth is year. He’s making a list, checking it twice, gonna find our who’s naughty or nice. Santa Claus… la , la, la… You know the rest. In 2015, the Naughty beer was Belgian-Style Dark Ale brewed with cinnamon, star anise, orange peel and habanero peppers for a bold mix of heat, citrus and spice. Any, yes, it was hot. The 2015 Nice was a Golden Ale that paid tribute to the Belgian brewers. It had a fruity nose and was a bit sweet and crisp. From feedback, many chose to be Nice rather than Naughty in 2015. The 2016 Nice edition has changed directions again to quite friendly quaff, a Holiday Milk Stout. The beauty with of this pair is you win either way, you can be naughty and nice and enjoy the results. With subtle sweetness and a palate full of holiday spice and bourbon, this beer can standalone as your dessert course all season long. adding cinnamon, nutmeg and vanilla beans into an ale that even Belsnickel could find enjoyment in. This 8.4% ABV treat is also a great pregame beer for any Naughty holiday activities, so let the vicious cycle continue. Slight sweetness from the lactose follows behind a rich chocolate malt profile. Give this nicety a whirl with creamy cheeses like brie and camembert or with dark chocolate desserts. While not one of the official Trappist breweries, St Bernardus, none the less, is a great abbey-style brewery with many favorite beers in their offerings. Their famous Abt 12 is rated 98 points and the Christmas Ale is not far from it at 93 points on Beer Advocate. Like many winter seasonal beers, this is a high alcohol content at 10% ABV beer so caution is given. Shortly after the Second World War, the Trappist Monastery St.Sixtus in Westvleteren was looking for somebody to commercialise their beer because they did not want to do that themselves anymore. ST BERNARDUS CHRISTMAS ALE is a dark seasonal brewed in the classic 'Quadrupel' style of Belgium's best Abbey Ales. (10,0 % ABV) Similar to all the beers from our brewery, it greets the drinker with the signature aroma of the St.Bernardus house yeast strain (in use since 1946!) Rivaling the complexity of the St.Bernardus Abt 12, St.Bernardus Christmas Ale offers a spicy, mint-like flavor profile exuding the tastes of warming alcohol, fermented molasses, apricots, licorice and marzipan that are highlighted by the perfect balance of brewing sugars. The perfect companion to enjoy a cold winter evening, with or without the company of your friends! While this beer has been on many of my lists, it must be included as a Christmas beer as well. The spruce flavors and aroma is nothing short of drinking in a Christmas tree. While DFH describes it as “sessional”, at 7.5% ABV I'm not sure that qualifies by definition, but it certainly does by drinkability. Spruce in a beer may not be for everyone, but I still remember my first full drink and finishing my first bottle and thinking, “That was not enough, I want another one”. And by my definition, that does qualify as a sessionable beer. DOGFISH HEAD PENNSYLVANIA TUXEDO — A spruce-infused pale ale, Pennsylvania Tuxedo pays homage to the flannel-suited hunters and gatherers who dwell deep in the backcountry of north-central PA. A dry yet doughy malt backbone lets the hops and spruce shine while still balancing out the bitterness, making this one an easy sipper. Brewed in collaboration with family-run outdoor clothing company Woolrich, Pennsylvania Tuxedo is a sessionable concoction with a grassy citrus kick complemented by the resinous conifer notes of fresh green spruce tips. We went into the forests of north-central Pennsylvania and Georgetown, DE, to pick these fresh tips ourselves. While many beers associated with Winter or Christmas time are big in alcohol and spice, Celebration moves in another direction and is actually an American IPA or as the label states, “Fresh Hop Ale”. FRESH HOPS are the freshest dried hops to come from the fields, typically within seven days of harvest. Over 90% of the world’s hop harvest happens between August 31 and October 31, and these hops are used throughout the calendar year. Can hops possibly be the same on November 1, one day after harvest, as they are on July 25, nearly one year after growing in the fields? The answer is no. We think of hops like dry kitchen spices—the flavor of thyme or rosemary right after the jar is opened is far more intense than it is six months later. The same can be said for hops. There are ways to control the way hops age and to reformulate and readjust as some of the aromas fade, but there’s nothing like the magic of the first bales of hops as fresh as can be. Stone has served as the epitome of west coast IPAs, big, bold and very hoppy. Over the past few years, a new IPA style has gathered much of the beer drinkers imagination, commonly know as New England IPA. The one key characteristic of this new take on IPA is that is it unfiltered—meaning you'll find yeast and other particulates flowing around in your beer. Brewers like to borrow from each other and we beer drinkers are the beneficiaries. The Stone Enjoy By series are released a few times a year. They want the buyer/drinker to focus on the fact that IPAs, as a rule, are meant to be enjoyed as fresh as possible. Therefore, Stone puts it right on the label, Enjoy By… In this case, Christmas. STONE BREWING ENJOY BY 12.25.16 — In most cases, skipping a step is a bad thing. Not this time. This version of Stone Enjoy By IPA omits the part where we filter out the extra yeast, hop sediment and proteins that build up in beer as a natural result of the brewing process. Though it may sound like it, this missed step was no misstep. By letting this IPA go unfiltered, its peach and tropical fruit hop flavors are amplified while its golden-hued color takes on a hazy appearance. Like its filtered counterpart, this IPA is brewed specifically NOT to last, and is shipped immediately to ensure hopheads get their hands on it as soon as possible. Winter Warmers are traditional seasonal beer and Samuel Smith’s Winter Welcome is a classic. Beer Advocate has this to say about this beer style. Throughout history, beer of somewhat higher alcohol and richness has been enjoyed for the winter holidays, when old friends get together to enjoy the season. Wassail, a festival to celebrate winter and the beer that goes with it, predates the Christian era. Winter Welcome is vintage-dated with a special label each year, and was first shipped to the US in 1990 - it was the first imported winter seasonal beer. Serve in a traditional Sam Smith tulip or nonik glass for the holidays. Taste: Honey-amber colored, creamy head of small bubbles, floral aroma and delicious caramel malt flavor with great finesse. Fine hop aroma finish and a fruity note from fermentation in open-topped stone "Yorkshire Squares." Food Pairing: Roast goose, smoked turkey with oyster dressing, rack of lamb, candied yams, Smithfield hams, fresh pears and apples, Christmas cake. Serve in crystal tumblers, or traditional Yorkshire tulip or nonik pint glasses. These malty sweet offerings tend to be a favorite winter seasonal. Big malt presence, both in flavor and body. The color ranges from brownish reds to nearly pitch black. Hop bitterness is generally low, leveled and balanced, but hop character can be pronounced. Alcohol warmth is not uncommon. BeerAdvocate offers a description on this traditional seasonal beer style. Many English versions contain no spices, though some brewers of spiced winter seasonal ales will slap "Winter Warmer" on the label. Those that are spiced, tend to follow the "wassail" tradition of blending robust ales with mixed spices, before hops became the chief "spice" in beer. American varieties many have a larger presences of hops both in bitterness and flavor. This is probably the most iconic Christmas beer. Really, this has been a tradition for 42 years. Each year a different beer, each year a different tree. That is TRADITION! And as a professional forester, trees have a special place in my life… as does beer of course. 2016 Anchor Christmas Ale. New tree. New recipe. Same traditions. A deliciously smooth winter warmer with notes of seasonal spices and a malty backbone, our 2016 Christmas Ale marks the 42nd annual release of this celebrated Anchor tradition. It is sold only from early November to mid–January. The Ale's recipe is different every year—as is the tree on the label—but the intent with which we offer it remains the same: joy and celebration of the newness of life. Since ancient times, trees have symbolized the winter solstice when the earth, with its seasons, appears born anew. With a heavily guarded, secret recipe, Christmas Ale is a highly anticipated seasonal delight, complex and full in flavor with a velvety texture and alluring, yet subtle, spiced aroma. The tree for 2016 is the “1,000 Mile Tree” or the lone pine found during westbound construction of the transcontinental railroad. Discovered in 1869, it was a lone pine amidst a vast and desolate landscape. The tree on this year’s label was hand-drawn by Bay Area artist James Stitt, who has been creating Anchor’s Christmas Ale labels since 1975. His charming illustration of the 1,000 Mile Tree includes a person at the top of the tree with a mug of beer, honoring an old legend that railway passengers sometimes attempted to climb the tree. The 2016 Christmas Ale is a deep mahogany brown with a creamy, tan head and boasts aromas of fruitcake, molasses, and fresh cut wood. The beer tastes of a roasted caramel malt, with notes of spiced chocolate and nuts. And it has a rich, smooth, and velvety mouthfeel. Every year the Anchor brewers look forward to formulating a new Christmas Ale recipe and tasting the fruits of their labors. We are always excited to please beer fans with its ever-changing recipe and label. Cheers from the Anchor brewers! "The Twelve Days of Christmas" (Wikipedia) is an English Christmas carol that enumerates in the manner of a cumulative song a series of increasingly grand gifts given on each of the twelve days of Christmas (the twelve days after Christmas). The song, published in England in 1780 without music as a chant or rhyme, is thought to be French in origin. You may have seen a few of these juxapositions of the ye olde Christmas song singing out twelve days and twelve gifts of Christmas. Since beer is one of my favorite gifts to get and gift, I have been compelled to offer up my list—in of course, twelve offerings. ... perhaps not exactly a turtle dove but a great beer and a classic Christmas beer. Mad Elf, what more needs to be said. Another much anticipated seasonal favorite. Big flavors with Pennsylvania Honey and West Coast Cherries. Again, as with many winter seasonal beers, this one is big on ABV at 11%. Warning, if you want to enjoy this one you best buy early and be disciplined since it may not be available by Christmas quaffing comes around. The holidays at Tröegs start with our inner Mad Elf momentarily taking over the brew deck. So blame “him” for this cheerful ruby red creation reminiscent of ripened cherries, raw honey and cocoa with notes of cinnamon, clove and allspice.